A classic black journal came in for this round of our book swap from Jenny, of TomoeBookArts. 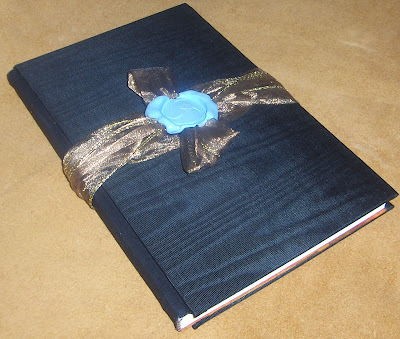 It is made with 100% rayon book cloth on the covers. The endpapers are brilliant orange and gold marbled papers. The sections are handsewn onto tapes, pressed, glued, then trimmed with a guillotine for a neat flush edge. Jenny's finishing touch is the ribbon wrapping held in place with her own seal. 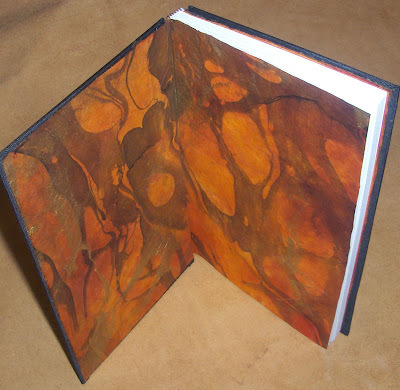 Visit TomoeBookArts.Etsy.com to see her other work. World Book Day Team Sale!